So, back to my story. Now where were we.... literally? Oh yes, we had just enjoyed a sunny, albeit windy, week in Provence. And we were headed north to the Loire Valley. 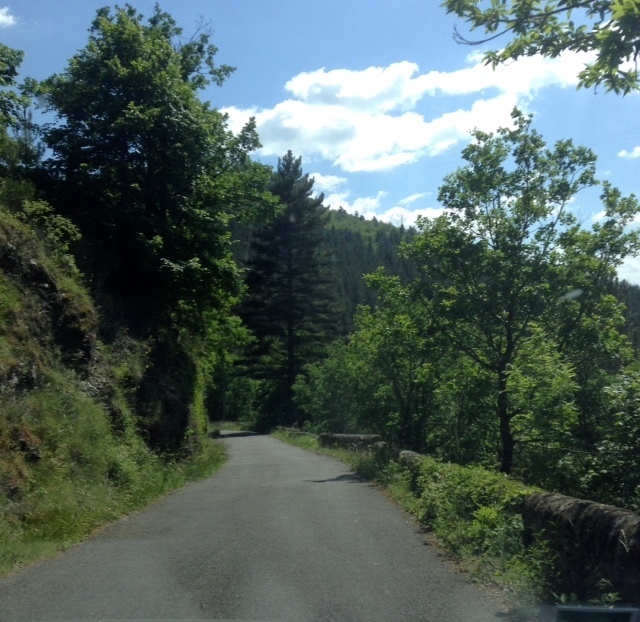 Hubby had done his research and plotted our route through the Languedoc, or more specifically the Haut-Languedoc, and the beautiful Parc National des Cévennes. Lonely Planet describes this area as "a land of craggy gorges, windswept, plateaux and dense forest, ideal for those who love being in the open air." Ah yes... that would describe one of us all of the time, and the other (namely me) much of the time. ...where you drive round a bend and see something like this. 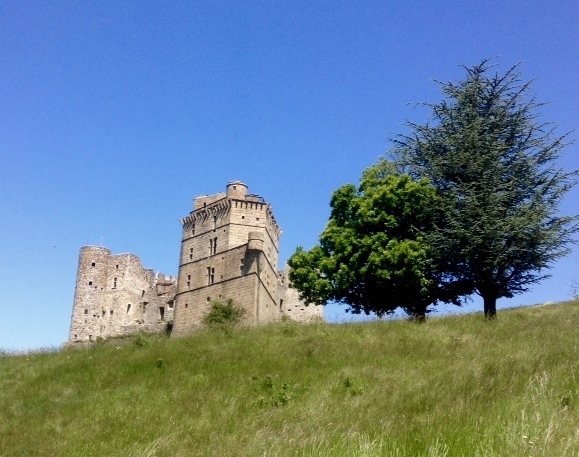 An old fortified château, partially derelict. And on the morning we happened by, totally deserted. We climbed the hill and found a small locked door with signs that parts of the castle were open to the public, just not today, I guess. We also saw a sign explaining that the interesting architectural feature of the castle is the way it's designed to look like the prow of a ship. Cool, eh? And so it went, the rest of the day. 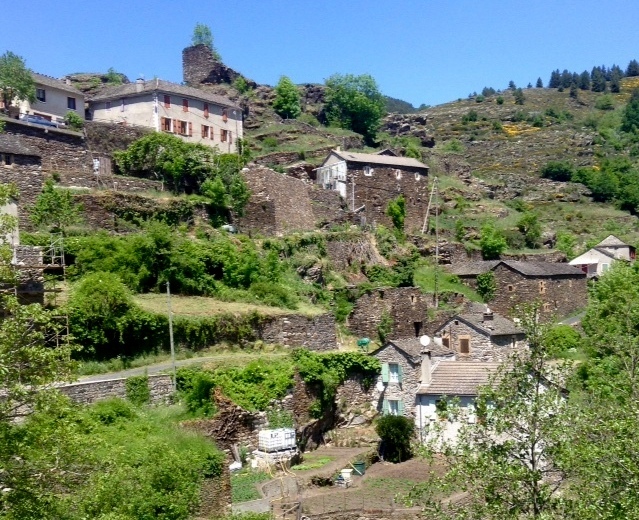 We saw stone villages, like this, built into the hillsides. 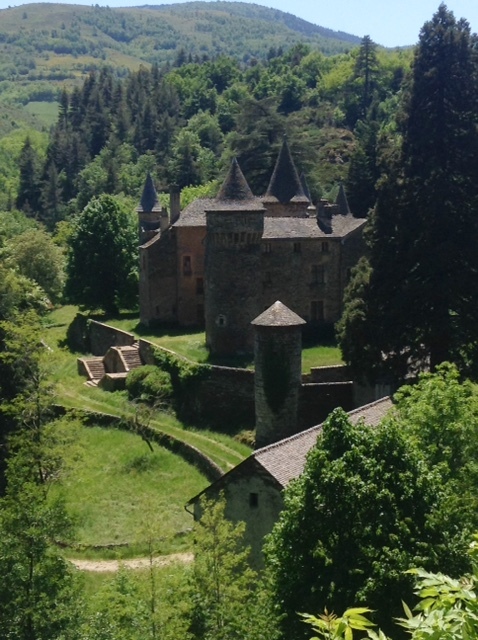 And shortly thereafter, this tiny idyllic château, tucked into a valley below the road. It's called "Château du Champ." Are those Rapunzel's tresses I see snaking down the side of that tower? No, maybe not. But such was the feeling of delicious unreality conjured up by our drive that day. And speaking of snaking. 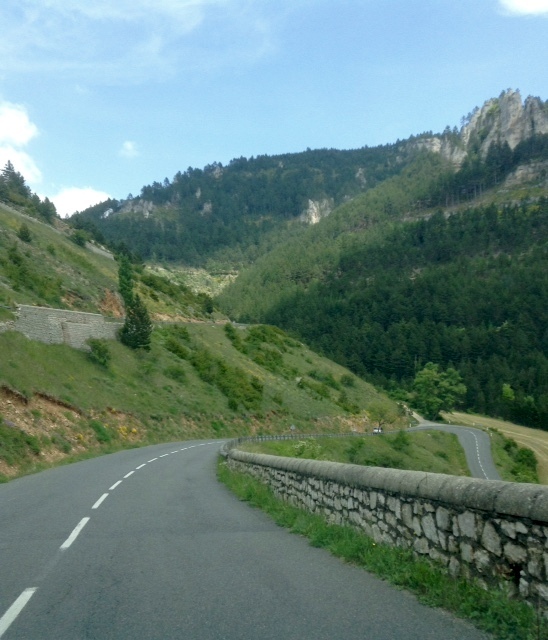 The roads of the Languedoc involved some serious snaking, maybe even Tour de France quality snaking. But as Hubby pointed out...we needed to stop gaping and giggling and snapping pictures and try to make up some time or we would never get to our accommodation before dark. And so we vowed to not stop again until we had reached Ispagnac, where we had booked into a small hotel for two nights. Why Ispagnac...which we had never even heard of nor read anything about? Well, we picked it out on the map because it was halfway to the next destination we hoped to reach in a couple of days, and well placed to explore the Gorges du Tarn, and maybe do a little hiking or whatever. Talk about serendipity. We drove into a small and seemingly empty village. Well, empty of people. And down a narrow street to our hotel. Once we had checked in and lugged our bags up to our basic, but immaculately clean room, we set off for a stroll. Around the corner we found a large square with a couple of restaurants, a cafe, and a boulangerie. All closed, but promising to open in a couple of hours. That building on the far right hidden behind the tree is a twelfth century church. Twelfth century. Imagine. We took a closer look and even wandered inside. The fact that it was open surprised us. There was a hand-lettered sign inside, for all "new visitors," explaining that, if one moved down the left aisle to the altar and then back up the right aisle, motion-triggered lights would help us to see the features of the building better. This is obviously a "working" church as the flowers on the altar, and burning candles attested. And for the next two evenings and mornings, we could hear the sound of the church bell ring on the hour. I loved that. I later read a review of our hotel on Booking.com where someone complained about the noise of the bell, but I thought it was charming. And I mean seriously, they should silence the bell in a building that's been servicing the town of Ispagnac for some eight hundred years because of a cranky tourist? Some people just shouldn't travel. Our first night in Ispagnac, we picnicked for supper. We had bought a rotiserie chicken, salad, and fresh bread before we left Avignon. We'd steamed and chilled some fresh asparagus at our cottage the day before. And we had the remains of one of our bottles of Chateauneuf du Pape. It was a bit chilly (okay... very chilly) but we had light gloves and had layered up against the cold. And the small park where we ate was on the banks of the river with a view of this twelfth century bridge. How awesome is that? I remarked to Hubby, as he was scarfing down chicken..."This is our kind of 'going out for dinner'!" The next morning we planned to do some walking. We would use a map provided by the local tourist office, following the route supposedly marked with yellow paint, and with the steps clearly described in our brochure, albeit in French, for the "three hour hike." Uh oh... why am I suddenly hearing the opening strains of the theme song for that 60's TV show "Gilligan's Island?" Didn't they set off for "a three hour tour?" We parked the car in a spot on the edge of this road, and climbed the steep hill, following the road through the tiny village of Paros. The picture below is of their bell tower. We weren't sure if that stone building built into the hill was a chapel, or not. The door was open but we didn't want to intrude, so we walked on by, still wondering. 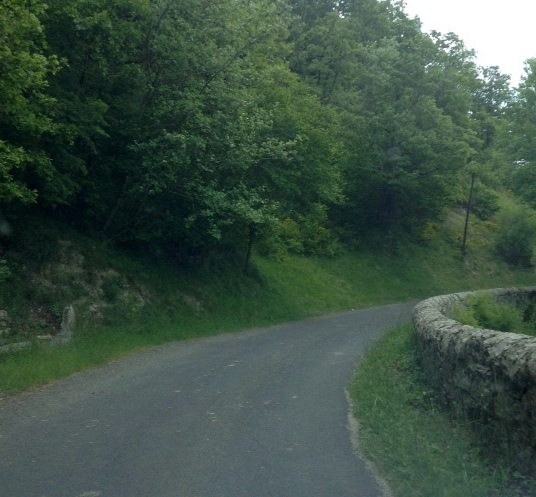 Our route continued along the narrow paved road, one of those "nonary" roads, I guess, past steeply sloped fields. This shot doesn't really show the steepness of the fields. It's funny how the camera seems to flatten hills and gorges out so they don't seem nearly as spectacular as they are in real life. After a few minutes we were above Paros, looking down on the village. And not long after that we came across the first of several small stone huts we'd see that day. Were these shelters for shepherds moving their flocks up to higher pastures? We weren't sure. We didn't see any sign of life on our walk, except for a few sheep in the distance. 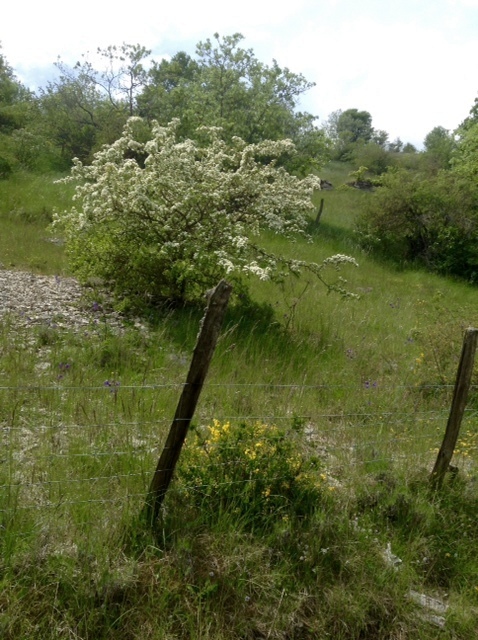 Only fields, rock fences, trees. And sunshine. 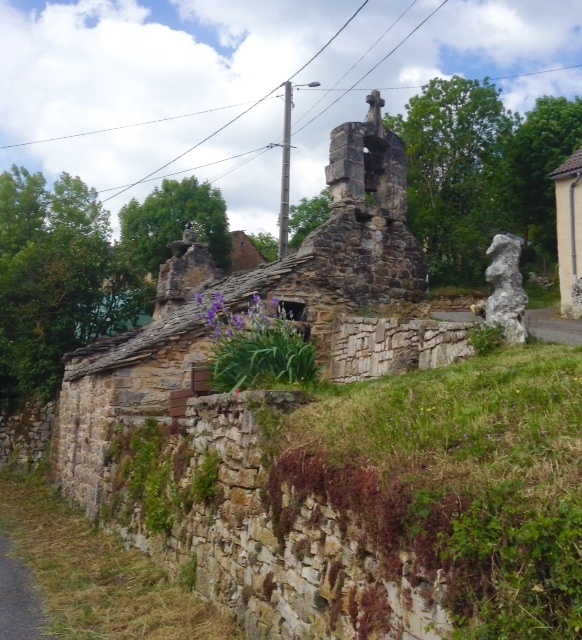 Finally we came to a cluster of three stone houses and several derelict ones nearby, the farming community of Le Mas Andre. 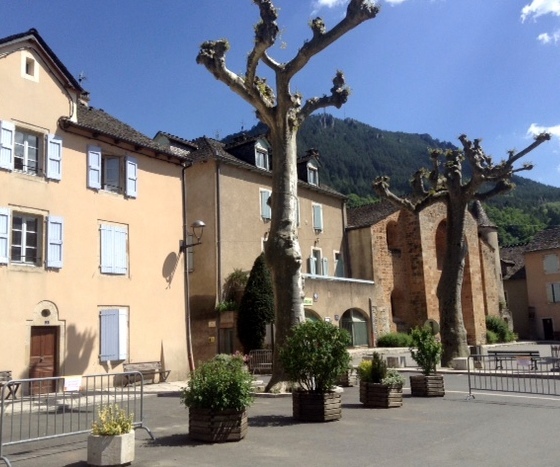 This community, its surroundings, even its way of life is part of the Parc Naturel des Grands Causses, and is protected as a Unesco World Heritage Site. 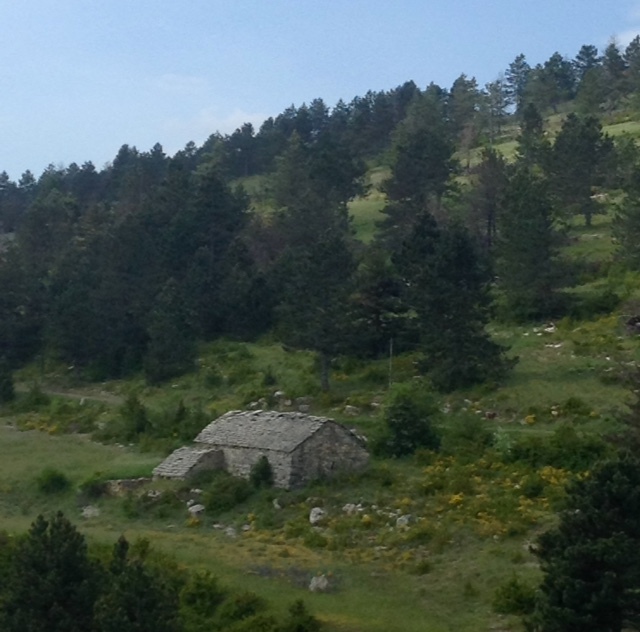 According to Unesco, the causses, or high mountain plateaus, and these small farms are important to the "cultural heritage of humanity" since they carry on the centuries old "agro-pastoralism" of the Mediterranean region. Some areas still practise "transhumance" which is the movement of animals and humans with the seasons, sheep and cattle being moved from the valleys to the high pastures in the summer, and back to lower pastures in October. Here our route seemed to peter out. Our map, which was entirely in French, directed us next to a path that ran beside "la forêt de pins." But the tarmac road we were on ran right through a farmyard, with no trespassing signs. And another branch ended in a second farmyard. And there was not a yellow paintmark in sight except for the one near the second farmyard. A curious, initially hostile, sheepdog came barking out from behind a barn. 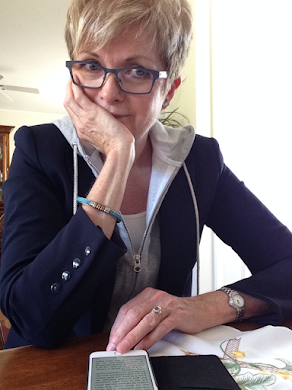 Hostile, that is, until Hubby's quiet dog-greeting en français "Bon chien. Bon chien. Eh? Eh?" seemed to work. Then his tail wagged and he was our friend. But he didn't know which way to go either. We finally found the dog's owner shifting a manure pile behind the barn. He jumped the fence in response to our inquiries, and with a little French, and a little English, and a lot of gesturing we managed to work out which way we should go. Maybe. Hopefully. This is the road he directed us to. It's a "draille", I believe, which is an old drovers' road. So off we went. I mean, the farmer must know the right way. And after a few minutes, we did see a pine forest ahead of us. So we continued along the road, that turned into a path across a barren, rocky area and down a steep hill. 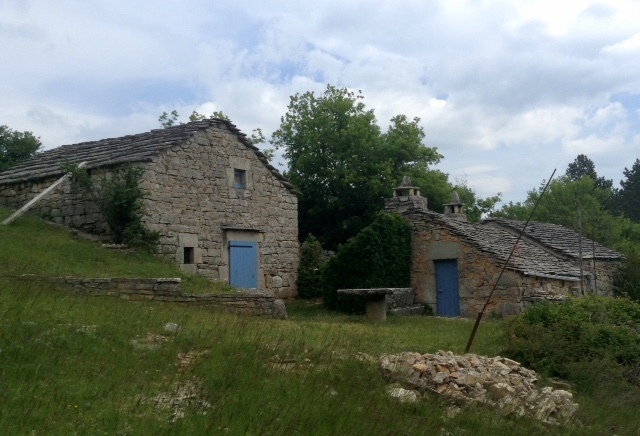 And then we came to these gorgeous old stone cottages. The windows were propped open, but the cottages were completely empty. We wondered if they were being readied for summer habitation. And then we noticed that this was the end of the road. Really. 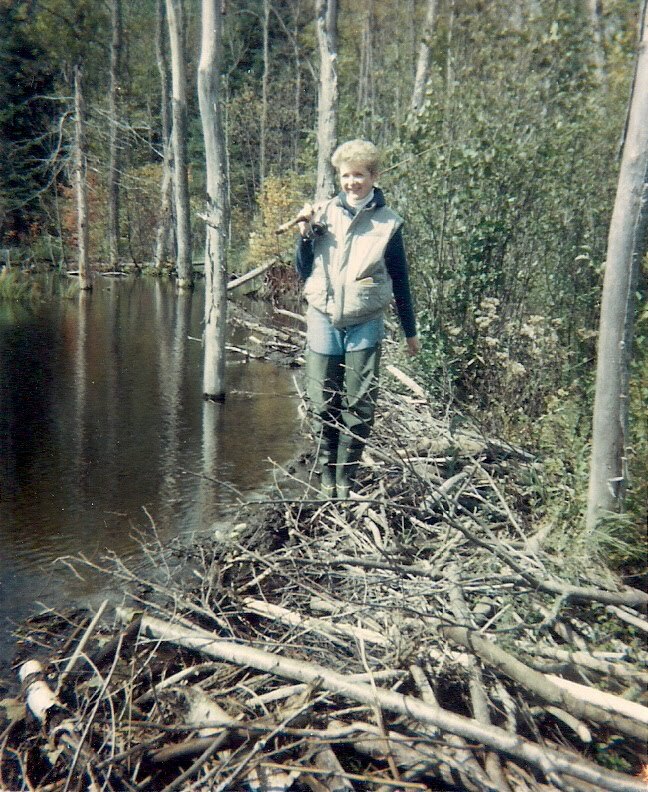 It ran a few metres further along and ended at the edge of a ravine. Ok-ay. With no idea where the path through the "forêt de pins" was, or if we had missed a turn when the drovers' road crossed the rocky hillside, we decided to turn around and retrace our steps. Well, almost. After an afternoon nap and a shower we were ready for an evening stroll, a glass of wine on the patio of the cafe around the corner, and dinner at our hotel. None the worse for wear. And much better for all the exercise and fresh air. See? And a good night's sleep wouldn't go amiss either. Tomorrow we would reluctantly be leaving lovely Languedoc behind. We'd been surprised and charmed by Ispagnac. How could you not love a town with a twelfth century church and a twelfth century bridge? 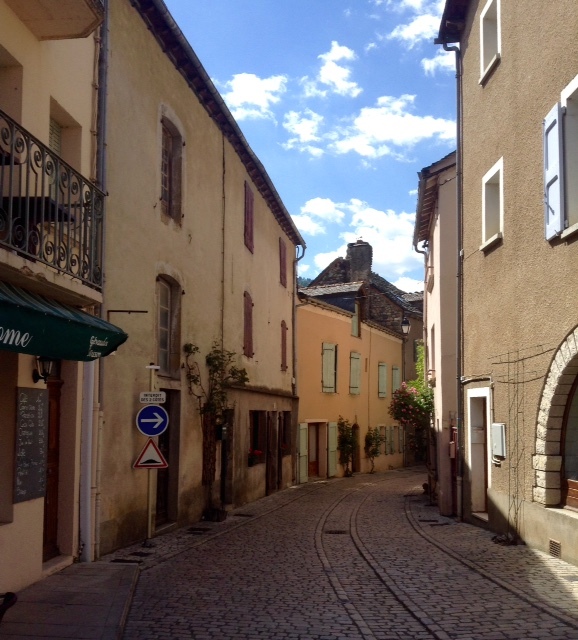 In fact, we'd been surprised and charmed by everything we'd seen since we left Avignon. Charmed by the fact that so much of what we saw was unexpected. So extraordinary to us, and so ordinary, or unremarkable to those who live here. Not necessarily unappreciated, just ... normal. We wished we could linger in Languedoc, but we'd Gorges to see tomorrow. And then those châteaux awaited, a few days up the road. And I had a birthday to celebrate. And then Paris CDG airport, and home. Where spring had sprung in full, the grass was growing, and Hubby's garden was probably no doubt pining for him. I must go now, friends. This post has become a "three hour tour" in itself! I love this post! We've had those days, both in France (we did a 170k hiking week in the Auvergne many years ago) and in rural Portugal. The getting lost is inevitably linked to the serendipitous discoveries. But oh, the sights and the smells and the memories. . . Thanks Frances. 170 k of hiking...now that sounds daunting! It was wonderful, but oh, we were tired at the end of the 20-25k days (honestly? I was nearly crippled at the end of the first two and the massive blisters didn't help at all!) But I was much younger then. Thanks, Wendy. I remember listening to our B&B host in northern Scotland telling us about the ancient footpaths in that country and he mentioned about carrying coffins. Imagine! Thanks Teresa. Bendy roads are the best, eh? Thanks Rosie. Yep...memories are the best thing to take home, and the photos that conjure them up. Thanks Iris. It was a wonderful trip, but I'm glad to be home. How great that you're keeping such a nice travel blog! The pictures are beautiful and make me want to traverse the same area someday. Thanks for sharing with us. So glad you're enjoying France. This is such a lovely area, not as touristy as Provence, and much more affordable. My husband and I enjoy vacationing in this area as well. Amusez-vous bien ! Thanks. It is a lovely area isn't it. And definitely not crowded. Looking forward to the next installment! This is wonderful and your descriptions just perfect…. Yep. Thanks for reading, Fiona. Wow. I'd go just to see that church. Thank you for sharing such a gorgeous and uncrowded part of France.